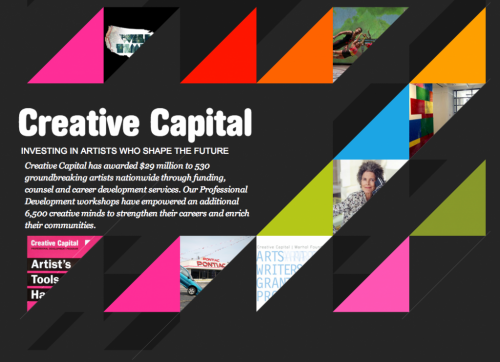 Creative Capital supports adventurous artists across the country through funding, counsel and career development services. Drawing on venture capital principles, we surround artists in all disciplines with the tools they need to realize their visions and build sustainable practices. Creative Capital’s funding model is based on the way venture capitalists work with entrepreneurs. Our approach combines financial support — modest amounts of money at strategic points throughout a project’s life, up to a maximum of $50,000 per project — with professional advice and a bevy of other non-monetary services, including skills building workshops and pro-bono professional services. We make a long-term commitment to each project and expect to work with awardees for a three to five-year period. We have found that, with this combination of money, services and time, the whole can be much greater than the sum of its parts. We began with an understanding that, to support the kind of creativity that moves society forward, some entities must be as willing to take risks on the innovators as the innovators themselves take. Our commitment to supporting risk taking artists and our own willingness to try new things sets us apart from more traditional funders. Creative Capital grew out of conversations that happened when the National Endowment for the Arts stopped supporting most individual artists’ projects in the mid to late 1990s; this period was known as the culture wars. This time was also the “dot-com” boom, and venture capital approaches that were key to launching dot-com businesses were being experimented with in the social sector, through what has been called social venture philanthropy or high-engagement grantmaking. Successful new economy entrepreneurs had been turning philanthropic, but they looked at traditional philanthropy—the approach of “Here’s a check, send us a report.” — and they wondered, “Who would do business this way?” So they decided to apply the methodologies they used to build their often world changing businesses to address social issues. But no one was applying those concepts in the cultural arena. It was decided that Creative Capital would be an experiment to see if venture approaches could be used to support individual artists.Creative Capital launched in 1999, under the leadership of the Andy Warhol Foundation and 21 other funders, with commitments of about $5 million. We are a hybrid — something between what a traditional grantmaker does, combined with what a good artist-service organization does, joined with an entrepreneurial sensibility. Our mission was — and still is — to support innovative artists in all disciplines and to help their work have the impact the artists envision, both out in the world and in terms of enhancing their career prospects. To date, we have committed $30 million in financial and advisory support to 419 projects representing 529 artists. Have you ever been met with resistance or criticism when Funding Individuals? What specifically were the concerns, and how did you respond? Over the years, we’ve learned that this is not a good grant for everyone. It is very demanding of the artist. We expect a high level of engagement, and it can be like being in a relationship with a high-maintenance spouse. People who really just need the money to fill out a budget and then move on to the next project are generally not helped by this approach. Nobody gets a check for $50,000 from us — it’s parsed out in small amounts. So if you just need money, we are the worst place to come. We learned to clarify this in our award guidelines and ask questions in our application that help us identify the artists who desire a high level of engagement, who are at a catalytic moment in their career trajectories and who would benefit the most from our services. Because we were adapting ideas from a really foreign field — the financial world — there was a lot of skepticism about the initial idea, which was the biggest challenge. This approach really resonated with people from the finance and business sectors, but it was more difficult to convince people rooted in the arts that this methodology could work. Also challenging early on was that we are not an endowed foundation, so we have to fundraise to keep our programs going. My attitude was to embrace the skepticism and say, “We don’t know if this is going to work either! It’s an experiment. We could get to the end of five years and decide that it hasn’t succeeded, or try to see what we could do better. Are you willing to go on this journey with us?” So that would be my advice: If you’re trying something new, be honest about that and don’t be defensive about the fact that it might fail. One of the things we now believe is that funders need to support an artist over the long run to help them reach their maximum impact. Many funders don’t give artists the time for their work to evolve and mature. With our long-term approach, we’re seeing the ideas we support expand and even morph into whole enterprises. Sometimes an idea that started out as a discrete project morphs into an ongoing series or even an organization! With a traditional philanthropy model, where you just give an artist a check and ask for a report a year later, you don’t get to experience that arc. In the same way that our grant is not for everyone, I have to say that this approach to philanthropy is not for every organization. We take a “whatever it takes” approach to supporting our artists. You have to have an extremely dedicated staff that consists of great problem-solvers. We work with so many outside professionals in our grantmaking process and to advise our artists, so you also need a staff that comes to the organization with a vast network in place. If you can’t find that kind of staff, this hands-on methodology will never work. Why does Indie Philanthropy and Funding Individuals matter to you? It matters to me because I think Creative Capital’s approach of combining money, services and time is so much more effective than just sending someone a check. If someone offered me the opportunity to work for a traditional foundation, I would not be able to take the job because I don’t think that work would be as effective as our model. I didn’t know that when we started this undertaking — I thought the money would be the biggest asset to the artists. So many of the artists we’ve worked with have told us, “It was not about the money. The money was great, but…” It’s the services, the mentoring, the access to a wider network that really transform the lives of the artists we work with.